Randa Wagner | Morrow County Sentinel Jeffrey Miller listens as Attorney Don Wick pleads his case for an O.R.bond on Miller’s behalf on his latest charge of theft and having a firearm under disability. The state requested a $25,000 bond and Judge Robert Hickson, Jr. granted it. 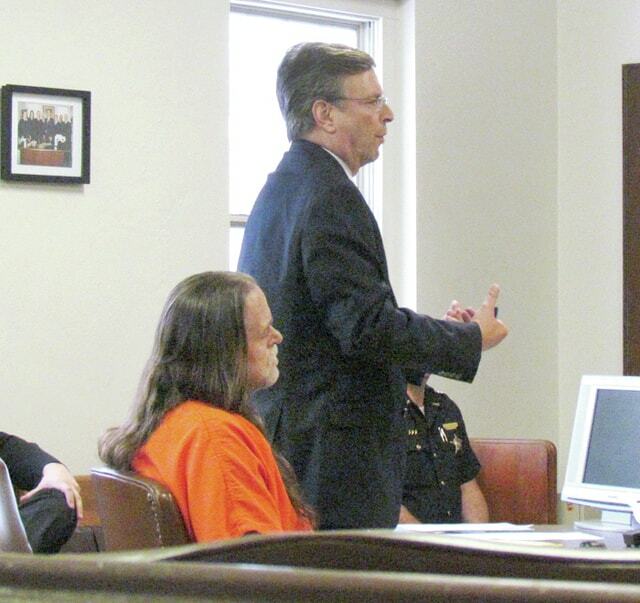 Jeffrey Miller appeared in Common Pleas court Monday to enter a plea on new charges after a grand jury secretly indicted him Friday for theft and having a weapon while under a disability. He was transported to the arraignment from the Morrow County Correctional Facility where he was being held since being served the indictment on Friday afternoon. Attorney Don Wick, serving as counsel on Miller’s burglary and criminal trespass case, appeared with him and entered a not guilty plea on Miller’s behalf. Friday’s arrest was the second in as many weeks, as Miller was also arrested on June 13, 2015 after Hidden Lakes Campground Security reported a fight at the campground involving Miller and a County Road 25 man. Miller was reportedly released on an O.R. bond after appearing in municipal court. Bond for the new charge created a lengthy discussion between Asst. Prosecutor Dave Homer, Wick and Judge Robert Hickson, Jr. Wick was requesting an O.R. bond (release on own recognizance), citing Miller has cooperated with court services, reported in regularly and abided by the terms of his original bond. Homer felt the weapons charge brought a level of seriousness to the court to a high level and requested a $25,000 cash bond. Wick pointed out that the state was ‘well aware of the weapons under disability’ at the time of the (first) arraignment, and they were aware of it during the previous two hearings. “While I understand there’s concern about when this matter came up, it only recently went to the grand jury within the last couple of weeks,” Judge Hickson said. Homer felt the seriousness of the weapons charge elevated the case and, additionally, “we are back to the original ‘sovereign citizens shenanigans,’ as Miller filed a criminal complaint claiming he is not subject to the court, which Homer felt was a violation of prior bond terms. Judge Hickson reminded Miller and Wick that any new motion or plea material submitted exceeding five pages of double spaced text must be filed by a motion. This is an effort by the court and prosecutor to avoid a barrage of documents containing material not directly relevant to the case. Judge Hickson set bond for the new charges at $25,000.00 surety or 10% cash. The original bond stands for the previous charges of burglary, attempted theft and criminal trespass after Miller allegedly occupied a home and property on State Route 314 that he did not have permission to use or live in. Miller and two co-defendants were arrested at the site in late April. Miller was remanded to the Morrow County Correctional Facility. A pretrial hearing is set for July 17 at 1 pm for the theft and firearm charges. A telephonic pretrial is set for July 19, and a trial is scheduled for August 24 and 25, 2015. Editor’s note: Tom Elkin was recused Tuesday afternoon as the attorney in the eviction case. Reach Randa Wagner at 419-946-3010, ext. 1803 or on Twitter @MorrCoSentinel.